Last week’s long run was a disaster. Since I was only 5 weeks out from the Blue Springs Marathon, I wanted to get in the longest run I’d be doing while preparing for my marathon. I decided to shoot for 22ish miles, depending on how I felt and how far my route (that I basically made up on the fly) ended up being. Because Lord knows if I made it back to the car at mile 21, there was no chance I’d end up making it to 21.1, let alone 22. I ended up with a 22 miler, but it was rough to say the least. While the run wasn’t great, I learned a couple of lessons from my long run that I’m sure will help me when I run my race next month. So while the run was less than ideal, the lessons learned will hopefully prove to be a lot more valuable than a smooth and easy 22 would have been. I’ll keep this brief, because most long runs aren’t exactly exciting to read about. I met with a bunch of Pack members at Lake Hollingsworth on Saturday morning. They were all planning on a quick 10 miler, so we took off on a different route than we have been running lately. I stuck with the some of the others for the first couple of miles, and then I started to drop back a little bit. We were clipping along at about an 8:25 pace, which was a little faster than I’d wanted to be running this early in my run, so I let them blaze ahead while I tried to conserve a little energy for the second half of my run. We regrouped a couple of times around water fountains, and every time we restarted, I quickly fell behind the rest of the group. As we were nearing the end of our run together, we stopped one more time, and this time the group really took off. We had about 1.5 miles left, and even though I was trying to stay under control, I was running at a 7:26 pace while the rest of our group was leaving me in the dust. After dropping my friends off at the yacht club, I went out for the final 12 miles solo. I started off pretty good, took a quick walk break after 15 miles, and ran to 18. And that’s where the wheels kind of fell off the apple cart. After I stopped to walk for a couple of minutes, I just couldn’t make myself run again. I tried a few steps, and everything hurt. I ended up walking the majority of the 18th and 19th miles. 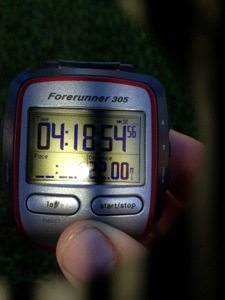 For some reason, I was able to run a little bit during mile 20 without as much pain. I did a lot of run/walk intervals for most of 20 and 21 and walked a bit more of the last mile than I wanted to. But I ran the last third of a mile or so and I was happy to be finished. Start Under Control–This is a lesson I’ve been reminded of many times. In any race or training run, you need to have an idea of what pace you’re expecting to run. And you need to make sure you stay at that pace, at least at the beginning. If you go out too fast, you will almost always fade at the end. And if you go out too slow, you’ll have more in the tank to make up some time in the 2nd half of your run. So when in doubt, dial it down a little bit at the top of the race. I knew this going in, and if I’m truthful, I knew I was in trouble from the outset. But I was willing to take the risk of running too fast just to have some people to run with, as opposed to doing the entire 22 miles by myself. When I’m at the actual race, I’ll really have no problem staying under control and really running my race. But even though this lesson was nothing new, this run was an excellent reminder of just how important it can be. I Can’t Run on Fumes–For each of the 3 marathons I’ve run, I’ve always gotten up multiple hours earlier than I ‘had’ to in order to eat a hearty breakfast. The Blue Springs Marathon will the first marathon I’ve trained for where the majority of my runs have happened in the morning instead of later in the day. Getting up in the morning, walking the dogs, and getting into town by 5:30 can be a bit challenging for me. For this particular run, I managed a few sips of coffee, a sliced banana with milk and honey, and a handful of ENERGYbits before the run started. When we got back to the cars after the first 10 miles, I had another 15 or so bits and a few sips of gatorade. And that was it. It was far cry from the eggs, potatoes, coffee, and fruit that have always helped me get through my marathons in the past. And for my prior long training runs, that usually happened in the afternoon, I’d have had a similarly substantial breakfast and a small lunch as well. I’ve never gone this far on an almost empty stomach, and I paid for it. I still felt pretty strong as I neared mile 18, but my plan for the last 12 miles was to run 4 segments of 3 miles each, and walk for 1-2 minutes between each segment. When I tried to start running after that walk break after mile 18, my legs just weren’t responding. I was completely out of gas. I needed some fuel, and I had nothing available for the last 6 miles. While I gutted it out, and I was even able to get a little bit of running in during the last 3-4 miles, it was pretty obvious to me that my lack of caloric intake that morning had done me in. No doubt about it, I’ll be up plenty early on October 27 for the best breakfast I can find in Kansas City. My run last week was a disaster, but it wasn’t a failure. While I always knew I needed to have a decent amount of food before running a marathon, now I know just how important it really is. You can’t drive a car without proper amounts of fuel, and I can’t run a marathon without proper amounts of fuel, either. If you’re the kind of runner than can knock out 26.2 with little more than half a bagel and a schmear of peanut butter, congratulations. But if you need some fuel for your marathon, you’re not alone. I’m just glad I learned this lesson on a training run instead of on race day. Because I’d rather have a really poor training run if it means a successful race day instead! Do You Need a Substantial Meal Prior to the Start of a Race or Long Run? Or Can You Roll Out of Bed, Hit the Ground Running, and Still Finish Strong? I have a lot less running experience than you do (2+ years, but only one half under my belt) and am training for the Lakeland Half and the Disney Full. On keeping up with faster runners: not an issue for me in general because its not even possible, but I’ve definitely paid the price for going out too fast and it wasn’t pretty. On fueling: My long runs are always mornings (which I prefer due to temp and time) but I have a very finicky morning stomach. A spoon of PB and honey, if anything, then GU along the way. You also made me question my longest long run. We are following Hal Higdons Novice 2, which has 20 as the longest. I think I am not going to limit myself to 20 that day, just see how far I get, but not farther than 23. So much of running is finding what works best for you. No matter what any book, magazine, or blog recommends, you have to find what works best for you. So by knowing to not go out too fast, what you need to eat before/during a run, and whether or not to follow a training plan ultimately you have to figure out what works best for you, often via trial and error. My goal with many of my posts is to explain what works for me, what doesn’t work for me, and how I figured out the difference between the two. And hopefully somewhere along the way, I can help a fellow runner struggling with some of the same issues I’ve had to deal with. And as far as meeting in person, one of these days for sure. I run with the Pack group a lot of times, and I try to make it out to the hills on Thursday nights when my schedule allows. And I’ll be running the Lakeland half as well, so if we don’t bump into each other somewhere before then, I’ll be looking for you before the race starts on 10/9!